That went well. Now, what shot shall I do next? Children attending the Club must be accompanied by a parent/guardian, or by an adult approved of by the parent/guardian. In the case of visiting groups, children must be accompanied by their own Group Leader. Members should not put themselves in the position of being alone with a young person or vulnerable adult and should ensure that they are always in the open or within sight or hearing of other adults when interacting with young people or vulnerable adults. Physical contact, “horseplay”, taunting, suggestive comments or other potentially inappropriate behaviour should be avoided. If members observe this type of behaviour it should be challenged. If members observe this type of behaviour between members of a visiting group of children, it should be mentioned to the group leader. 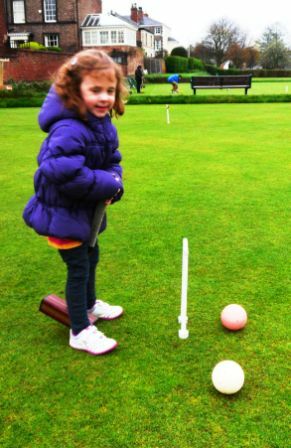 All members should make themselves familiar with the full York Croquet Club Safeguarding Policy, a copy of which is displayed in the clubhouse, and are reminded that if a child or vulnerable adult reports an incidence of abuse to a member, the member should ensure that the conversation is if possible only continued in an area within sight of others and that he/she never gives a promise of secrecy. If any form of abuse is observed, suspected or reported to a member it must be acted upon. An incident report form should be filled in and the Club Safeguarding Officer informed at the earliest opportunity. The Officer will then report the incident to the Club Chairman and together they will decide on the appropriate course of action – which may be to involve Police, Social Services or NSPCC.